Curcumin is an extract that comes from the turmeric root. It's a powerful antioxidant that's being studied for its ability to stop cancer, amongst other health benefits. Studies have already shown that curcumin helps stop prostate cancer growth by 50%, shrink lung tumours by 36% and colon cancer masses by 40%. But that's just one of the ways it stops cancer. Read on below to find out more about how curcumin stops cancer as well as an amazing new study that actually shows how curcumin stops cancer growth in its tracks! In a recent new study, published in the Proceedings of the National Academy of Sciences, the researchers used x-ray crystallography to get 3-D images of curcumin in action against cancer cells. The curcumin physically bound to the DYRK2 enzyme, which in turn stops proteasomes from forming. Now, this is very significant because, these protein complexes feed the development and growth of the cancer cells. 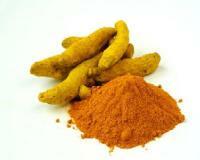 But when curcumin binds to this enzyme, the cancer cells are no longer able to grow and multiply. BREAKTHROUGH: This natural nutrient is proving to kill cancer stem cells! This is great news for people suffering from aggressive and lethal types of cancers, like triple-negative breast cancer and multiple myeloma. And, even better news is that curcumin stops the cancer from growing and spreading without affecting healthy cells, unlike chemo, readiation and other drugs. Scientists have discoverd that cancer cells have a certain hierarchy. …Similar to a bee colony. There’s the worker bees, and the queen bee, whose sole responsibility is to ensure the survival of the colony by laying eggs. Like the queen bee, these cancer stem cells’ sole responsibility is to ensure the survival of their colony by mutating and evolving. But now there’s new hope for cancer sufferers.